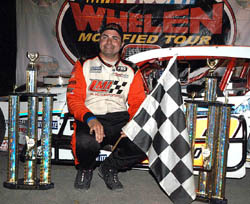 Donny Lia started out front and led every single lap in the NASCAR Whelen Modified Tour race at Waterford Speedbowl on the way to the victory. 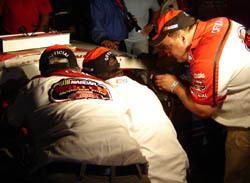 But the 150 lapper was more than just a race for second-place. Actually, the race wasn’t as easy as it looked for Lia. The young driver knew that he had a great car, but was on pins and needles for much of the night. Lia qualified third for the race and redrew the number one before the line-up was set. Before the race, a well-wisher joked that all he had to do in the next 150 laps was to not let anyone pass him. That’s exactly what Lia did. “If we could have gotten by Ted, who knows?,” said Beers who finished third behind Christopher. “He was holding us up pretty good. If we could have gotten by him, we could have probably stayed on Donny’s bumper at least. I don’t know if we could have passed him, but we could have stayed with him. The only way that it looked possible to take Lia on hand-to-hand was on a restart, but even that didn’t look very likely to happen. Meanwhile, Marquis was using the laps after the restarts to try and catch those ahead of him. “On the restarts, everyone would separate a little bit and then we would start reeling them in,” said Marquis. The tight racing behind Lia was fine with him. “We were able to stay out front and control the race at our own pace,” said Lia. At the end, Lia was in his own zip code while Christopher, Beers, Marquis and Whitt were nose-to-tail for the rest of the top five. Hirschman was in the middle of that logjam as well until one lap to go, when he got spun in turn three and dropped out of the top 10. The victory was Lia’s first on the Modified Tour this season and moves him into the third position of the point standings. 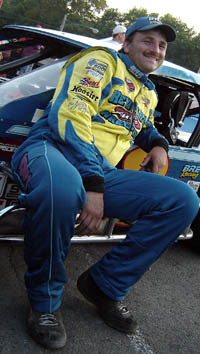 It also ends a streak of tough Tour luck dating back to last season that included broken wheel hubs, wrecks and anything else under the sun for the Long Island driver. Lia pulled away from the field on every single restart. Ted Christopher finished second and ran in that position for most of the second half of the event. Close behind him were a cast of characters which included Eric Beers, Marquis, Tony Hirschman and Steve Whitt. Christopher had the best track position of this bunch, but not necessarily the best racecar. “We’ll take a second place,” said Christopher. But the race wasn’t over when the checkered flag flew. An extended post race technical net drew in the tops finishers. When it was over, nobody could beat Lia on the track or in the tech line either. A team of NASCAR officials looked over Lia’s car. They checked the wiring, they checked the engine compartment, they even looked under his seat but the Lia #18 was judged to be 100% legit. Because of this luck, Lia was never able to get too comfortable during the race. And the way that it went at Waterford meant that the real race was for the runner-up spot. 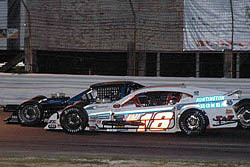 Speed51.com will have more from the race later this week with Modified leftovers and stories of how two young drivers followed in their fathers’ footsteps at Waterford. Stay tuned.